Los Angeles, CA – From the mind of comic legend Stan Lee, the celebrated creator of Spider-Man, X-Men, Iron Man, Thor and many others, comes an all-new adventure Stan Lee’s Mighty 7: Beginnings, arriving on Blu-ray/DVD combo and DVD from Cinedigm. Stan Lee’s Mighty 7: Beginnings is produced by Stan Lee Comics, a joint venture among Genius Brands International, Stan Lee’s POW! Entertainment and Archie Comics, and is the first in a trilogy of feature-length films premiering on The Hub Network and supported by a licensing program to include digital comic books, toys, apparel, and video games. Available exclusively at Walmart and Sam’s Club locations nationwide, the hilarious, post-modern adventure features the voice talents of Armie Hammer (The Lone Ranger), Christian Slater (“Mind Games”), Mayim Bialik (“Big Bang Theory”), Teri Hatcher (“Desperate Housewives”), Flea (Red Hot Chili Peppers), Darren Criss (“Glee”), Sean Astin (The Lord of the Rings), Jim Belushi (Snow Buddies), Michael Ironside (X-Men: First Class), and – of course! – Stan Lee. Interestingly, Stan Lee’s Mighty 7: Beginnings marks the first time Stan Lee has written himself into one of his projects. When seven aliens crash land on Earth in hot pursuit by evil forces, they meet the famous comic writer Stan Lee who is in the midst of a writer’s block. The perfect subjects for his new book, Stan agrees to hide them in his Malibu beach house and teach them all they need to know about becoming super heroes. The Stan Lee’s Mighty 7: Beginnings Blu-ray/DVD Combo and DVD include $6.25 e-Movie Cash, and the Combo is packed with exclusive, must-see content such as extended scenes, Script-to-Screen featurette, Composer’s Favorite Music Cue’s, a Stan Lee Trivia Game, Production Sketches and more. The DVD includes downloadable wallpapers and coloring sheets. 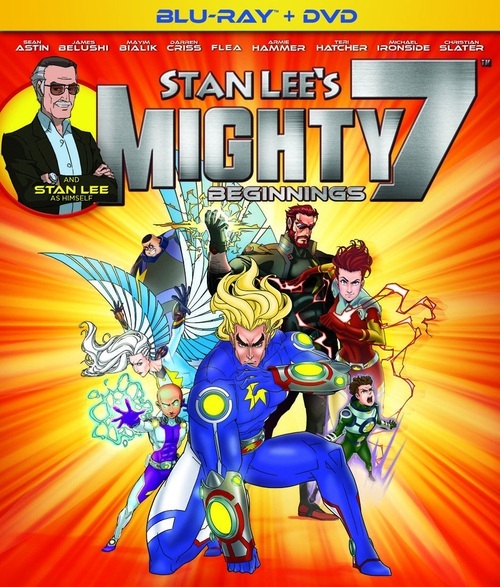 Stan Lee’s Mighty 7: Beginnings made its broadcast premiere on The Hub in February 2014. Reality, fantasy and adventure collide in this action-fueled animated movie from comic book legend Stan Lee. When Stan stumbles upon seven aliens who have crash-landed in the desert, he soon finds himself swept up in their journey as a top-secret military force led by the ominous Mr. Cross and the evil reptilian Taegons close in on the group. He quickly moves them to his Malibu beach house, but in order to guarantee their survival, Stan must show the Mighty 7 how to develop their powers and become Earth’s newest team of superhero fighters. Featuring the impressive voice talents of Sean Astin, Jim Belushi, Mayim Bialik, Darren Criss, Flea, Armie Hammer, Teri Hatcher, Michael Ironside and Christian Slater, it’s the first installment in a fascinating trilogy.